Total plasma IgE and serum NO levels in type 1 allergic mice. (A) ○, control mice; ●, sensitized mice. Each point represents the mean ± S.D. of 10–15 mice. *P < 0.01 compared with control mice. (B) At 5 and 7 days after the primary sensitization (PS5 and PS7, respectively), the mice were sacrificed. On day 8 after primary sensitization, the mice received the secondary sensitization of OVA. The mice were sacrificed at SS7. Each point represents the mean ± S.D. of 10 mice. *P < 0.01 compared with individual control mice. **P < 0.05 compared with PS5 mice. Changes in hepatic P450 isozyme activities in IgE-mediated allergic mice. □, control mice for PS7 and SS7; ▪▪▪, sensitized mice (PS7 and SS7 mice). Data are expressed as the mean ± S.D. of 4–6 mice. *P < 0.01 compared with each control mice. **P < 0.01 compared with PS7 mice. (A) APAP formed from 10 μM PH after a 5-minute incubation with microsomes (1 mg/ml); (B) 4-OH-TB formed from 800 μM TB after a 30-minute incubation with microsomes (0.5 mg/ml); (C) 1′-OH-BF formed from 2 μM BF after a 5-minute incubation with microsomes (0.4 mg/ml); (D) 6-OH-CHZ formed from 20 μM CHZ after a 5-minute incubation with microsomes (0.5 mg/ml); (E) 1′-OH-MDZ formed from 10 μM MDZ after a 4-minute incubation with microsomes (0.1 mg/ml). 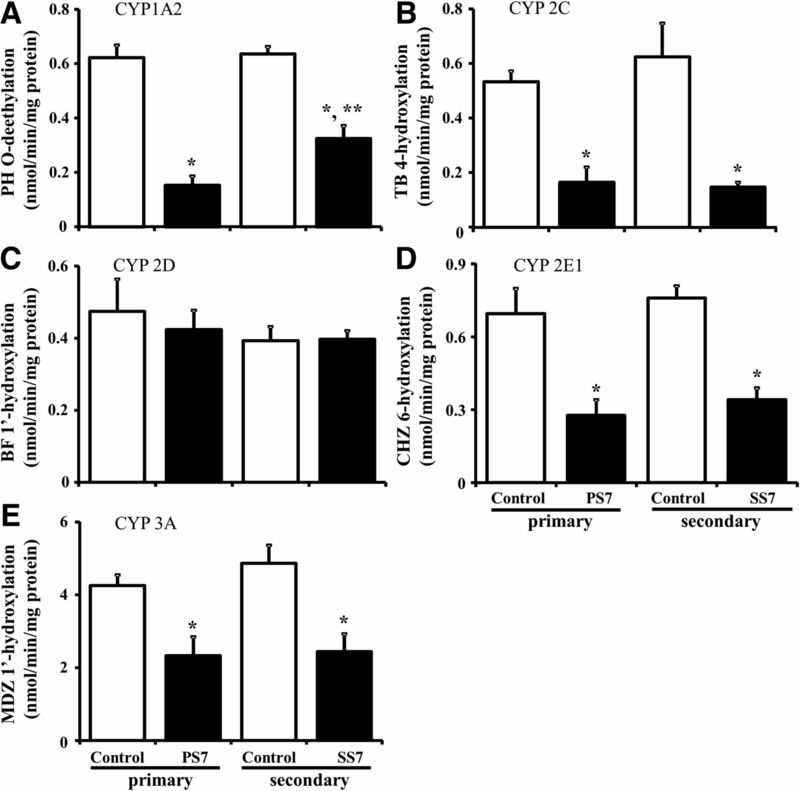 Hepatic protein expression of CYP1A2, 2C, 2D, 2E1 and 3A in sensitized mice. The protein expression is expressed in terms of percentage of the control mice (Cont.) on day 7 after i.p. injection of saline, with the control set to 100%. All samples were loaded in triplicate. 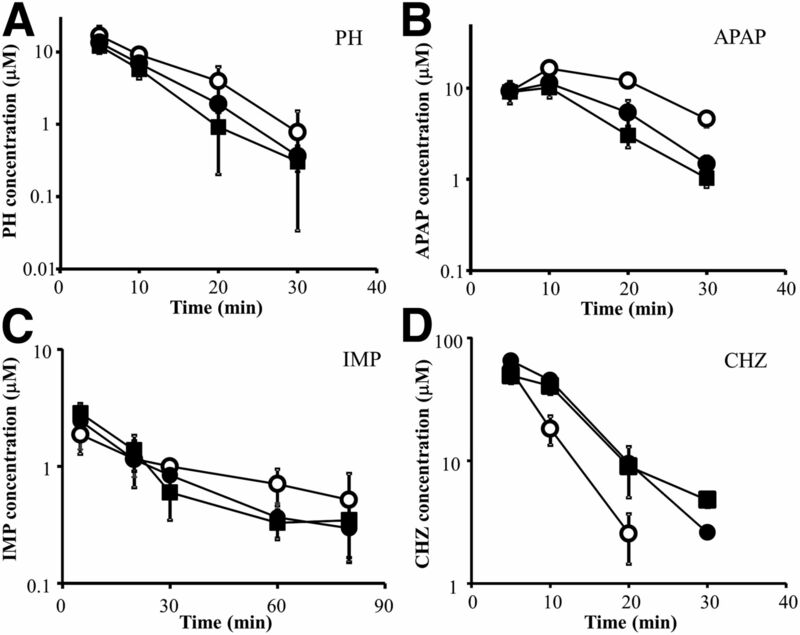 Plasma concentration-time profiles of PH, APAP, IMP, and CHZ after single intravenous injection. 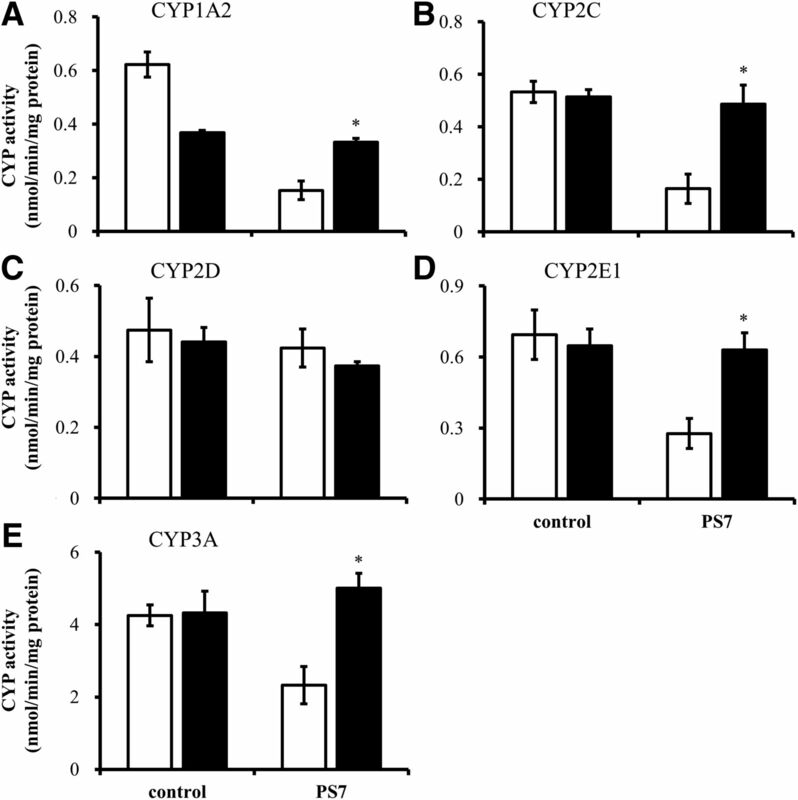 P450 probe substrates were intravenously injected at each dose of 5 mg/kg: (A) PH (CYP1A2 substrate); (B) APAP (CYP1A2 metabolite); (C) IMP (CYP2D substrate); (D) CHZ (CYP2E1 substrate). ○, mice seven days after i.p. injection of saline (control); ●, PS7 mice; ▪▪▪, SS7 mice. Data are expressed as the mean ± S.D. (n = 4–6). Hepatic PH and CHZ concentrations after intravenous injection. (A) parent PH; (B) parent CHZ. Control: mice seven days after i.p. injection of saline. Data are expressed as the mean ± S.D. (n = 4–6). *P < 0.01, significantly different from control mice. ND, not detectable. 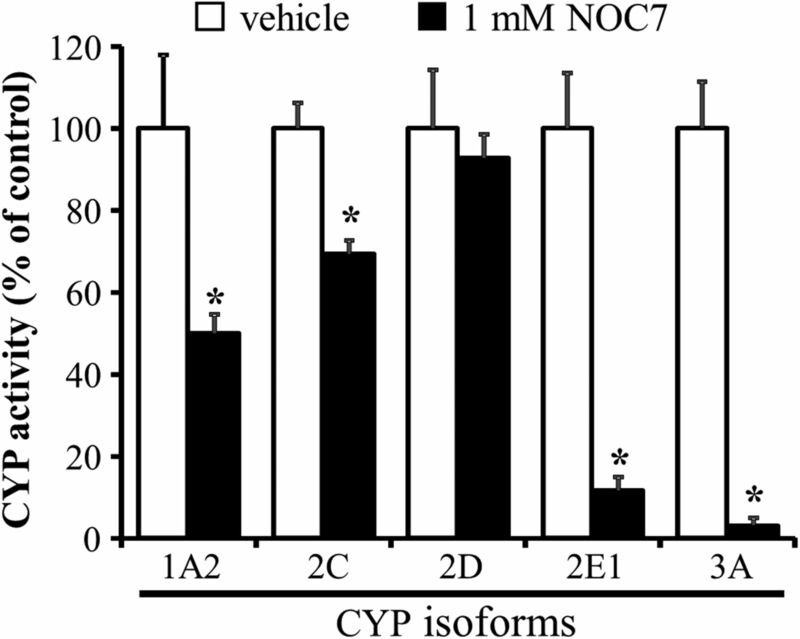 Inhibitory effect of NO on the activities of hepatic P450 (CYP) isozymes. Hepatic microsomes were preincubated with 1 mM NOC7 or vehicle for 30 minutes at 37°C. Data are expressed as mean ± S.D. (n = 3) of the percentage of P450 isozyme activities in the absence of NOC7. *P < 0.01, significantly different from the vehicle. 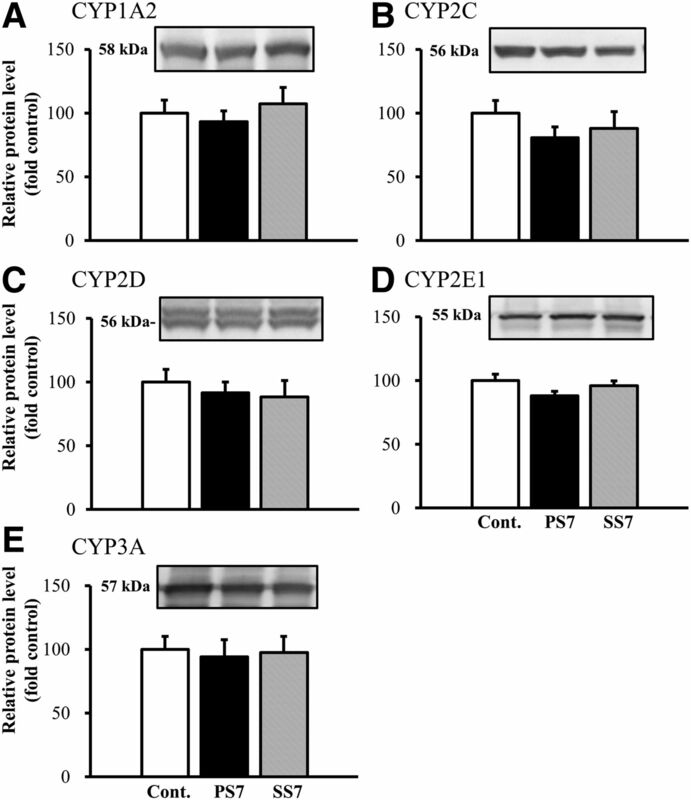 Changes in microsomal hepatic P450 (CYP) activities in type 1 allergic mice treated with carboxy-PTIO. □, mice without carboxy-PTIO treatment; ▪▪▪, mice with carboxyl-PTIO treatment. Control: seven days after i.p. injection of saline. Data are expressed as the mean ± S.D. (n = 4). *P < 0.01, significantly different from PS7 mice without carboxy-PTIO treatment. Pharmacokinetic parameters after single i.v. injection of PH, IMP and CHZ. Data are expressed as the mean (n = 4–6). AUMC, the area under the first moment curve; Vdss, apparent volume of distribution at steady state. T1/2, half-life. ↵a Significantly different from the control mice; * P < 0.05. ↵b Calculated by Vdss = dose × AUMC/(AUC)2.